National Parks 5 oz Silver-new! According to the ancient Chinese calendar, those born in the year of the Tiger are kind, thoughtful, sensitive and fearless. - from the country of Singapore. This pure 99.99% gold coin dated 1986 contains 1/20th of an ounce of solid gold. Approximately 13-14mm in diameter. (Smaller in size than a US dime.) Beautiful Tiger design. Nice proof-like Uncirculated condition. The larger size Australia Tiger coins have the same design. This pure 99.99% gold coin contains 1/20th of an ounce of solid gold. Beautiful small solid gold Tiger design. 1998 series 1 lunar gold coin. Approximately 13-14mm in diameter. (smaller than a US dime.) Its official: Reported very low mintage of only 10,427 coins were made worldwide!. Nice proof-like Uncirculated condition. Size is smaller in size than a US dime. Contains 1/10th of an ounce of solid gold. From the first series of lunar gold coins made by the Australia government. Very low mintage of only 9,085 tenth ounce gold coins produced! Made of pure 99.99% gold by the Australian government. 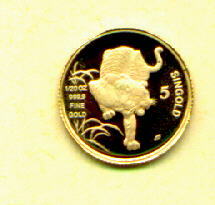 Coin dated 1998 - contains a FOURTH of an ounce of solid gold, with the lunar Year of the Tiger design (series 1). Each Tigercoin from the Australia lunar gold series is approximately 20mm in diameter. Scarce! Only 5,683 fourth ounce gold coins were made! Nice proof-like Uncirculated mint condition. Click for lunar coin dimensions and coin mintages. Same design as the other Australia Tiger gold coins. Not sure what Chinese year you were born in? CLICK on the Menu in the left column to see our many other gold coins. BUY WITH CONFIDENCE - we’ve sold to more than 1,000 happy customers in Yahoo auctions! Shop for tigers on gold and silver coins, collector supplies. 1,000+ happy customers. PayPal, money order, checks accepted.